Paul Volcker, the former Federal Reserve chairman credited with taming the inflationary threat of the 1970s, has warned that further quantitative easing will fail to repair economies in Europe and the US. Mr Volcker, addressing a conference at Gleneagles in Scotland, said the decision by the Fed to begin a third round of asset buying — nicknamed QE3 — amounted to the “most extreme easing of monetary policy” he could recall. Mr Volcker’s comments came as the World Trade Organisation intensified the economic gloom by slashing its global growth forecasts. The organisation said it expected the world economy to grow 2.5pc this year, from a previous 3.7pc forecast, while growth in 2013 would slow from a previous estimate of 5.6pc to 4.5pc. Although not explicitly directed at Fed chairman Ben Bernanke, Mr Volcker’s words will be seen as a veiled criticism of the limitations of the current strategy being employed by the Federal Reserve. Last week, the Fed announced a programme of unlimited purchases of mortgage-backed securities in an effort to boost the economy and drive down unemployment. It also said it would hold rates near zero until mid-2015 . The strategy has elicited rebuke from some critics, including the finance minister of Brazil, who accused the US of potentially reigniting currency wars. The Fed is already committed to buying long-dated Treasuries, which together with the new round of QE will see a total of $85bn (£52bn) spent each month buying assets for the rest of 2012. Mr Volcker stressed that although the risk of inflation was not imminent, central bankers had to be careful. “The risk is that central bankers are not able to tighten policy in time. Will they be able to pull back fast enough from loose monetary policy?” he said. In the UK, the Bank of England is also expected to pump more money into the system. The recent minutes of the monetary policy committee revealed several policymakers believe more stimulus will soon be needed and analysts are predicting a further £50bn of QE could be launched at the November meeting. 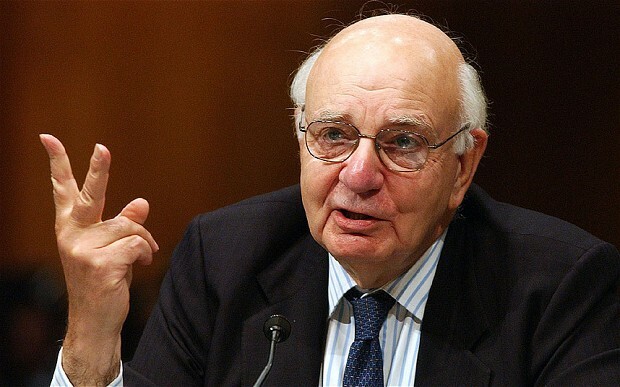 In his address, Mr Volcker concluded that the US was still the country that should lead the world recovery. “We can no longer look to China to rescue the world. The Chinese economy has slowed 50pc since its peak and is no longer able to support international growth.